Our June’s issue is here! We are happy to feature Dante this month. This 78-page issue is PACKED full. – the new Facebook group Black Bunnies Unite! – Coverage and testimony on The NorthEast Bunfest! – A pictorial of all the Exempel covers that you voted on. This issue is heavier than most of our issues. 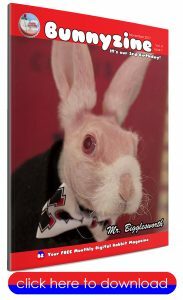 It may contain some strong content as we are dealing with the realities of abandoned bunnies. Please be advised before downloading. April is here again and normally we prefer not to feature a rabbit as our way of symbolically standing against impulse purchases and subsequent abandonment. This year, we decided to make the abandoned rabbits our feature. 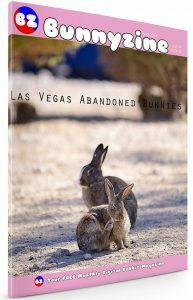 We focus this issue on the Las Vegas Dumpsite Rabbits. 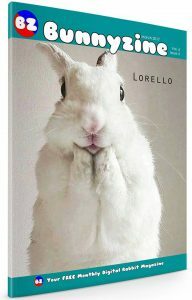 March’s Issue is here and this month we feature the beautiful Lorello who is not only absolutely adorable but has a thousand facial expressions. We also cover the Las Vegas tragedy, the NotJust4Easter 2018 campaign, the invention of Penelopads, a small bunny binky pictorial, an absolute MUST-READ story of a truck crash with two bunnies inside, and last but absolutely not least, a heart-warming story of a community of rabbit-lovers in Winnipeg that banded together to help a man and his bunny get out of the cold and into a home. You cannot miss out on this issue! It’s fantastic! 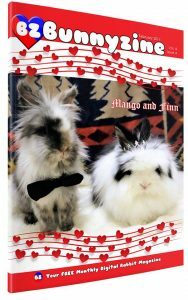 This month, we feature Mango and Finn as our Valentine’s couple and we have a huge Valentine’s pictorial made up from pictures submitted by you. We also have a few tributes for Cooper and Betsy. We have an amazing plot-twist: Caleb is going to be joining me on January 4th to do a live stream where you can ask your questions or give your comments to Caleb LIVE 🙂 (we will be using previously submitted questions and comments during the live stream). Stay tuned to this page to find out exactly when and where you can catch the January 4th’s live stream with Caleb! Also in this issue, Our Rabbits Around The World takes us to Norway. Our newest installment of The Emotional Rabbit tells the tale of a pregnant rescue mom, Heidi. We have a pictorial of Kansas the Bunny’s Car collection. Bunny’s New Years Resolution. Our new Bunny Bites section. And one tribute that is very dear to my heart. Seana’s bunny Lily was dying. Seana needed to get permission from work to leave, fly home, and try to make it to Lily on time. Did she? Find out as we talk with Seana about Lily and see Seana’s memorial letter to Lily. We also added a pictorial because, well, Lily’s really special (and beautiful). Our hearts go with Seana. As always, the issue is free to download. Oh dear, oh dear! I remember the days when Bunnyzine was about 30 pages long. Here is your 80-page Halloween issue that is completely PACKED with a whole bunch of things both related and non-related to Hallowe’en. 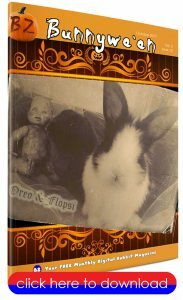 I’m SUPER pleased that Gretta Parker’s bunnies, Oreo and Flopsi, are featured in this issue AND since Gretta is the master of Hallowe’en, we snuck in a pictorial of Gretta’s Halloween’s across the years! But that’s not all….we have Halloween Movie/Book reviews, Halloween Bunwe’en Art pictorial and a Hallowe’en pictorial from your submissions! But not everything revolves around Hallowe’en, and so we’ve included a pictorial of the San Diego Bunnyfest, articles on Hormonal Bunnies (part of The Emotional Rabbit series), Hurricane Irma evacuation, disaster preparation, an excerpt from Ears O’Fluffin, an interview on Rabbit Agility, Rabbits Around The World series coming from Australia, and some upcoming events for October! This is an incredibly bundled package just waiting for you to click. We have so many reasons to celebrate! Our last issue reached over 1400 downloads because of you sharing this post! Let’s see if this issue can beat that! 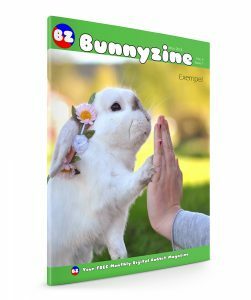 We also received submissions for our biggest pictorial yet and because of your bunny bed pictures, we have OVER 50 pages of the bunny bed pictorial (yes, you definitely put me to work for this issue). 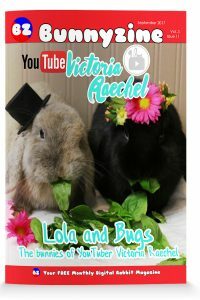 This month, we are feature Lola and Bugs who are two adorable buns that frequently appear in Victoria Raechel’s YouTube videos. Victoria produces videos on small animal care (primarily hamsters and bunnies) and her adorable and appealing videos have earned her a YouTube Silver Play Button Award for reaching over 100 000 subscribers! 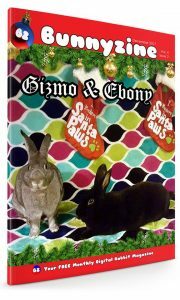 We are super proud to be featuring her bunnies this issue. We also have two book reviews Wee Bunny Book and Butters Comes Home), a fantastic article on emotional rabbits, our rabbits around the world series takes us to war-stricken Venezuela (it’s an eye-opener), and an article about how to identify genuine animal care complaints from drama. We also have a special announcement from Ears O’Fluffin, and we have an events section listing some of the events taking place in September. We’ve got poetry from Kansas The Bunny (spoiler: It’s a cute parody of The Beverly Hillbillies) and a comic from Regarding the Secret Life of Rabbits, and the issue concludes with a whopping 50+ page pictorial of BUNNY BEDS!!!! All sent in by you! 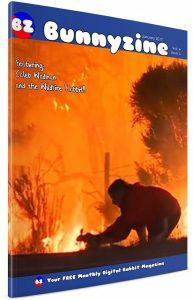 I hope you enjoy this issue and let’s keep the reader count rising We are so close to moving into the next phase (getting advertising revenue and establishing a revenue-to-rescue conduit).